Gordon Brown's willingness to borrow his way out of trouble could lead to the collapse of sterling, shadow chancellor George Osborne has warned. In the Times, he accused the PM of being "irresponsible" and suggested he "doesn't care" how much he borrows. Sterling has fallen sharply in recent weeks amid fears about a UK recession. Labour has accused Mr Osborne of "talking down" the economy, with the prime minister dismissing the attack on his handling of the crisis. But a former advisor to three Thatcher chancellors said he had been right to raise the issue. There has been a so-called convention that opposition spokespeople do not say anything that might damage the economy and talk down the pound, said BBC political correspondent David Thompson - and Mr Osborne would appear to have broken that. But the Tories say Mr Osborne is the shadow chancellor and is meant to give a critique. "But you do not want, even in a very deep recession, your exchange rate to go into some kind of freefall because it completely undermines confidence in your economy." Will Hutton, of the Work Foundation, and Conservative MP Michael Fallon, who is a member of the Commons' Treasury select committee, said it was clear the pound had fallen and there was no point in keeping silent about it. Mr Fallon said: "It's the shadow chancellor's job to warn, and there's a very serious issue with sterling now." On Friday, the pound slipped to a 13-year low against a basket of other currencies, hovered near a six-and-a-half year low against the dollar, and traded at a near-record low against the euro. Mr Osborne says the more the prime minister borrows, the less attractive the currency will become. He said: "We are in danger, if the government is not careful, of having a proper sterling collapse, a run on the pound." He said that would push up long-term interest rates, "which is a huge burden on the economy". "The more you borrow as a government the more you have to sell that debt and the less attractive your currency seems." He went on to label Mr Brown's tactic as a "scorched-earth policy", which a future Conservative government would have to clear up. "His view is he probably won't win the next election. The Tories can clear this mess up after I've gone," he said. A Labour spokesman said George Osborne was making "panicky" criticisms "in a desperate last throw of the dice to save his career". "We have abormal economic times here," he said. "You can witness that by the G20 meeting in Washington this weekend and George Osborne is running the risk of a run in sterling or making false predictions if and when sterling recovers." And Liberal Democrat shadow chancellor Vince Cable said Mr Osborne's criticism signalled "massive intellectual confusion" within the Conservatives over fiscal policy. He said: "For the last decade, the Conservatives have been rubbishing the idea of Britain joining the euro on the basis that we need to have a flexible exchange rate, yet when we have a flexible exchange rate, they complain because it's flexible." Mr Hutton said the most important thing was to persuade the banks to maintain public borrowing. He said banks that had been bailed out by public funds should have had non-executive government directors placed on their boards to oversee how the money was used. Mr Fallon said: "The really important thing here is that we continue to protect the public's stake in these banks, which has already gone down, and that we get it back with added value." BBC political correspondent Nick Robinson said Mr Osborne's intervention was "pretty extraordinary" and marked the sense of frustration from the opposition that they are seeing political and economic orthodoxy torn up. The Tories have chosen to say this is "very dangerous indeed" - but they are doing it in a way in which they themselves can be accused of damaging the economy, he said. And until the government's pre-Budget report due out on 24 November, it is hard to tell how great a departure from recent economic practice we are actually going to see, he said. 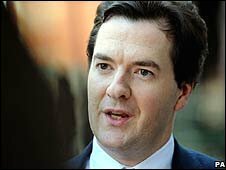 Mr Osborne has also been criticised by former Conservative treasurer Lord Kalms, who told the BBC that former shadow home secretary David Davis would be more appropriate as shadow chancellor. Up until now, any unease among Conservatives about Mr Osborne's performance during the credit crunch has been off the record. Last month, Mr Osborne admitted he had "made a mistake" by meeting Russian billionaire Oleg Deripaska while on holiday in Corfu in the summer. But he denied claims he tried to solicit a £50,000 donation for the Conservative Party.